Denture Repair Lab: The most convenient way to get your broken dentures fixed and returned – fast! After serving the professional dental community exclusively for many years, now we offer the same expert service and incredibly fast turn-around to the general public. Who to trust with your dentures is an important, personal concern. When your dentures break, you want the quickest, easiest way to get them fixed, but you also want them fixed properly. Denture Repair Lab offers the highest quality repair service at the lowest price, in the most convenient way possible. Denture repair: Read about 10 signs you may need to repair dentures here. Denture Repair Lab is a full-service dental laboratory. Our dental lab has been providing denture repair services exclusively to dental professionals all over the United States. In 1998 we were pleased to offer same-day denture repair services to the public at the same low cost offered to dentists and dental professionals. We assure you that we will give your denture the same attention to detail that we have given to your dental professional for many years. Our denture repair services begin with a staff of experienced and fully trained dental technicians. Our modern facility uses the most advanced resources available, and we keep up-to-date with the latest materials, techniques and technologies. We use only the best and most reliable ADA approved materials. We strive to meet and exceed your every expectation by providing you with a wide variety of high-quality denture repair services. Our dedicated team of technicians ensures consistent quality standards, and our friendly, knowledgeable customer service representatives are always ready to help you with any questions about your denture repair. Contact our friendly customer service any day of week from 9am - 10pm EST. At Denture Repair Lab, we provide the fastest and highest quality denture repair services in the industry. Every denture repair is completed the same day at our facility under the strict supervision of our dental professionals with more than 20 years of experience. Our highly qualified and trained dental technicians not only repair dentures that are broken, but also fabricate hundreds of dentures and partials every week. We are not a middle-man company; we are America’s largest denture repair lab. Your dentist trusts us, so you know that you can rely on us for your denture repair! We want to make it as fast, as easy, and as convenient as possible for you to get your broken dentures fixed. We offer a very special service – the ability to get professional, fast and affordable denture repair service without even leaving your home! We understand that you need your dentures back right away. That’s why we do everything we can to make it convenient. We offer prepaid label, which is first class mail to ship it to us (takes about 3-5 business days ), we offer USPS Priority Mail or for $25 upgrade USPS Express from the lab. 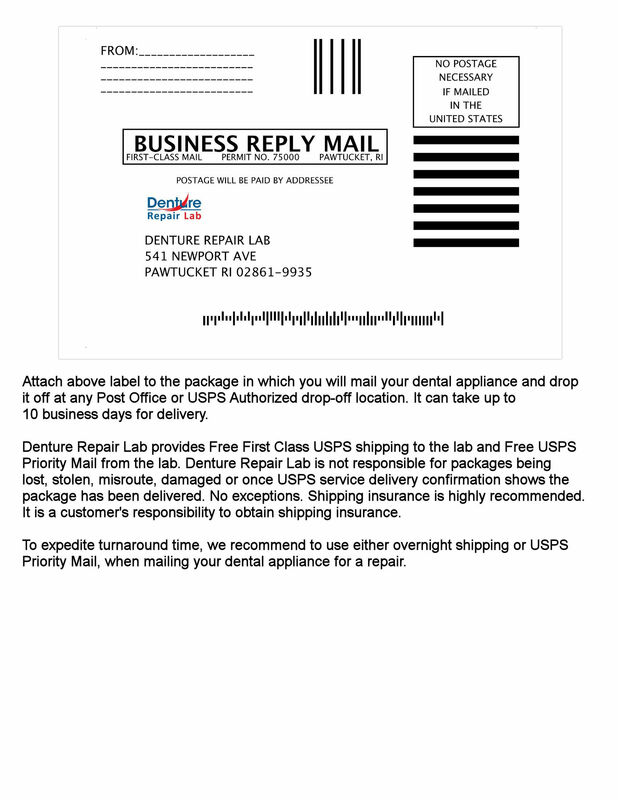 Dentures are repaired and mailed back same day. We offer free denture storage container with the order and 30 day warranty. If you need to fix dentures, home denture repair and denture repair kits are not recommended. Instead, turn to Denture Repair Lab, where we have been providing quality denture and teeth repair services since 1998. For your convenience, we will mail back your dentures on the same day we receive your broken denture – it’s that simple! The Company started as a full service dental lab offering services for dental professionals only. Due to our customer requests, Denture Repair Lab was formed to help disabled people to get professional, fast and affordable denture repair service in confidence of their home. We have served thousands of people in USA and Canada. Denture Repair Lab offers comprehensive denture services for people anywhere anytime. Outstanding customer service and top quality repairs. That's what Denture Repair Lab is known for and what we continually deliver to our customers.